Lucky for me, I really don’t have much of a sweet tooth which is always nice when you’re trying to eat clean! When I do want something sweet, it’s usually dark chocolate which admittedly isn’t that bad but I wanted to see if there was something better that I could make myself… cue raw chocolate. Yes that’s right, you make your own chocolate for this! Sound crazy? It’s two ingredients (raw cacao + coconut oil), three if you want to add some stevia for sweetness and it literally takes minutes! I like pomegranate seeds in mine but you could add nuts, a different fruit or anything else you like. The raw cacao + pomegranates are packed with antioxidants and the coconut oil has the good fats your body needs as well as a slew of other benefits! This is a dessert you don’t have to feel guilty about at all and I love that. The first thing you can do is get the seeds out of your pomegranate. I think a lot of people are intimidated by this (and if you are, you can buy the seeds right at the grocery store) but it’s crazy simple to do and a lot less expensive… plus they’re fresh! Take a pomegranate and slice it in half. Holding one half firmly over a bowl (the juice will splash a little so make sure the bowl is deep enough to hold it inside the bowl), tap it hard with the back of a spoon. 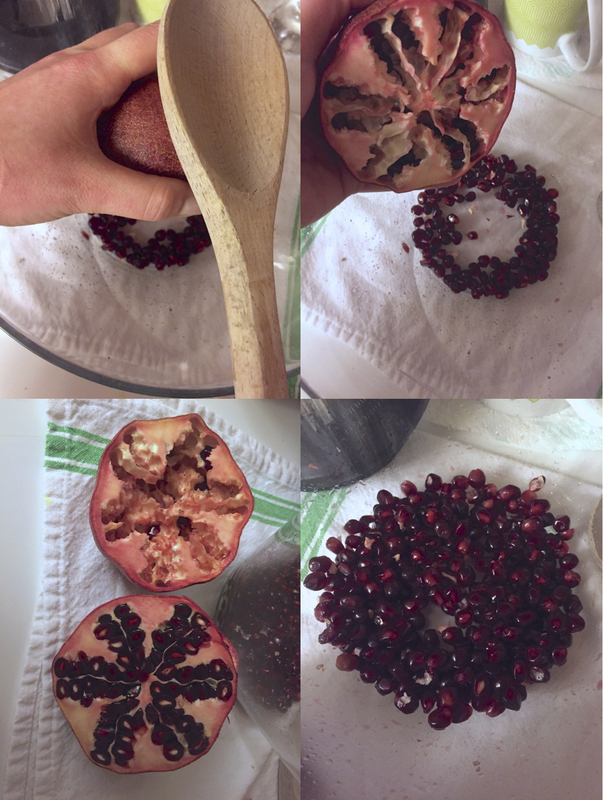 Keep rotating the pomegranate half in your hand as you knock the seeds out. You’ll be able to see when all of the seeds are knocked out, repeat on the other half. There will be little bits of the flesh in the seeds when you’re done, you can just pick them out with your fingers. Now you can line a mini muffin pan with 8 mini cupcake liners. 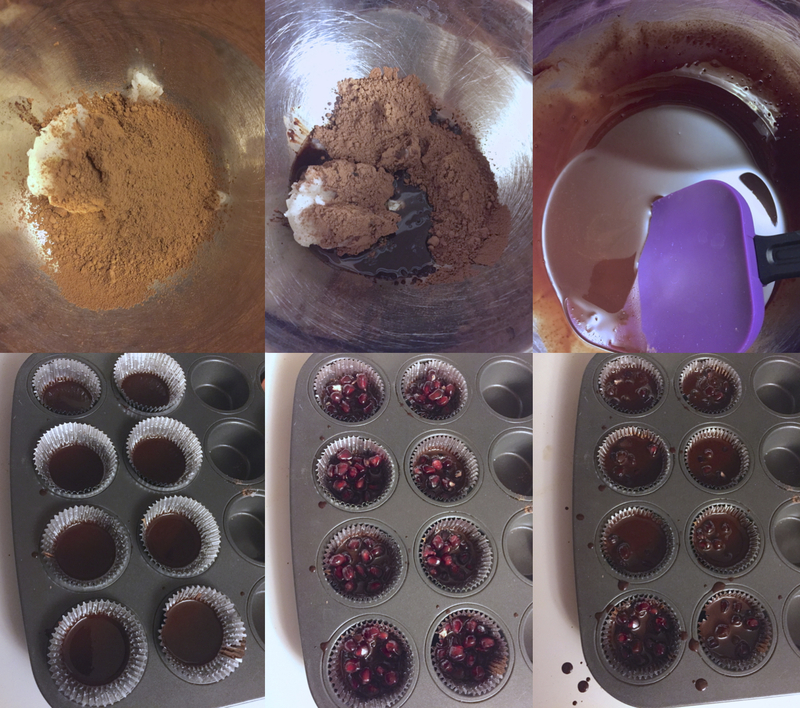 If you don’t have a mini muffin pan, just put the liners on a baking sheet! Put a couple inches of water in a small saucepan and bring it to a low simmer. Set a heatproof bowl on top of that and add 1/4 cup coconut oil + 1/4 cup raw cacao powder. Stir until just melted and add in 2 packets truvia, you can omit this part if you like your chocolate a little more bitter. 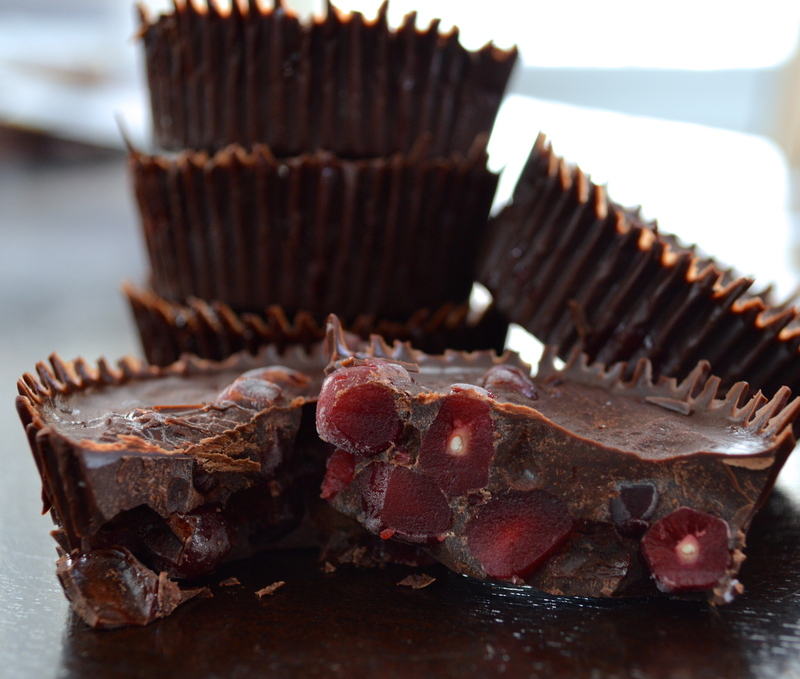 Put 1 tsp of chocolate into each liner and then add 1 tbsp pomegranate seeds into that. Top with 1 tsp more of chocolate in each cup and freeze for at least 30 minutes! 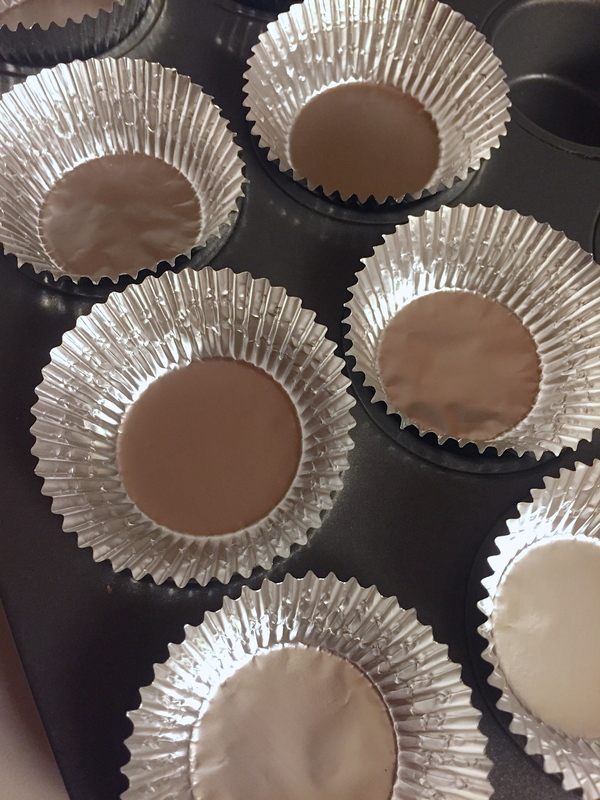 Line a mini muffin pan with 8 mini cupcake liners. Put a couple inches of water in a small saucepan and bring it to a low simmer. Set a heatproof bowl on top of that and add coconut oil + raw cacao powder. Stir until just melted and add in truvia. 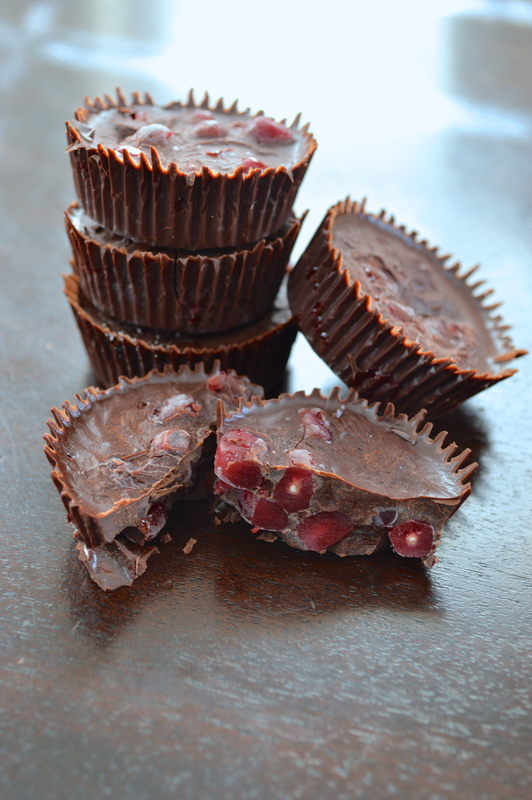 Put 1 tsp of chocolate into each liner and then add 1 tbsp pomegranate seeds into each cup. Top each one with 1 tsp more of chocolate and freeze for at least 30 minutes! I currently have a pomegranate that I don’t know what to do with but now I know what I’m making – these! They look delicious! Love it when that happens! And you’ll love these, they’re so yummy! These look so good! plus they really don’t have many ingredients at all, im very tempted to try!! Thanks! They’re delicious and so so easy to make!